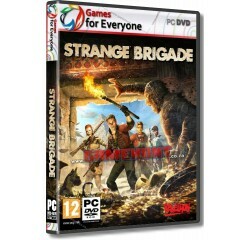 Strange Brigade - R180,00 : Game Hunt, Where we lead, others follow. ONE GRIPPING ADVENTURE - Hunt the foul Seteki through a rip-roaring campaign filled with dangerous dig sites, prodigious pyramids and crumbling caves packed with bountiful foes to send back to the afterlife. Explore alone or team up in 2-4 player online co-op! FOUR FEARLESS FORTUNE HUNTERS - Travel the ancient world as one of four dashing agents trained to tackle the supernatural. Unleash devastating magical powers and unload powerful prototype weapons such as the fire-spitting Krakatoa, the ice cold Chill Burster, and the brain-busting Blunderbuss! A LEGION OF MALEVOLENT MONSTERS - Seteki is not the only mythological menace to have awoken ... she's brought an army of loyal beasts with her! Face her many nefarious ne'er-do-wells, including moaning mummies, fire-breathing assassins, armour-plated minotaurs, giant scorpions and much, much worse! TONS OF TERRIFYING TRAPS - Keep an eye on your environment to find creative ways to boff your enemies! Decapitate the undead with spinning blades, fry them to a crisp with fire traps, crush them with a well-placed boulder and more. You wouldn't set them on your team mates ... would you? MESMERISING MODES - Challenge yourself in two extra modes for 1-4 players. Try the fast-paced Score Attack where speed meets style, or take on wave after wave of deadly foes in the action-packed Horde mode! Processor - AMD Ryzen 3 2200G or Intel CPU Core i3-2100® or equivalent AMD® processor.